Recently we've returned to weather you'd except to inhabit an Irish summer so today the heat of the sun roasted everyone then the rain brought about being very cool meaning you're going to be either freezing cold or too warm in whatever you wear *insert loud sarcastic cheer*. I borrowed another one of mam's cardigan which is not too heavy yet not too light and it kept me comfy throughout the messed up weather this morning which really needs to make up it's mind up in terms of rain or sunshine. I also love the beautiful wintry colour with the polka dot crop top and polka dot skirt ! I wasn't too sure of putting together two prints that happen to be different colours to one another at first since it can all look a bit too much but I was doing ecstatic happy dances when I walked out the door in prints everywhere without looking like a seven year old. In other news, Half my hair is actually purple now *thank you mammmmy* and I feel like some kind of Bratz or Monster High doll now which makes me feel happy and what's even better is that when the colour begins to fade out it will hopefully turn lilac ! 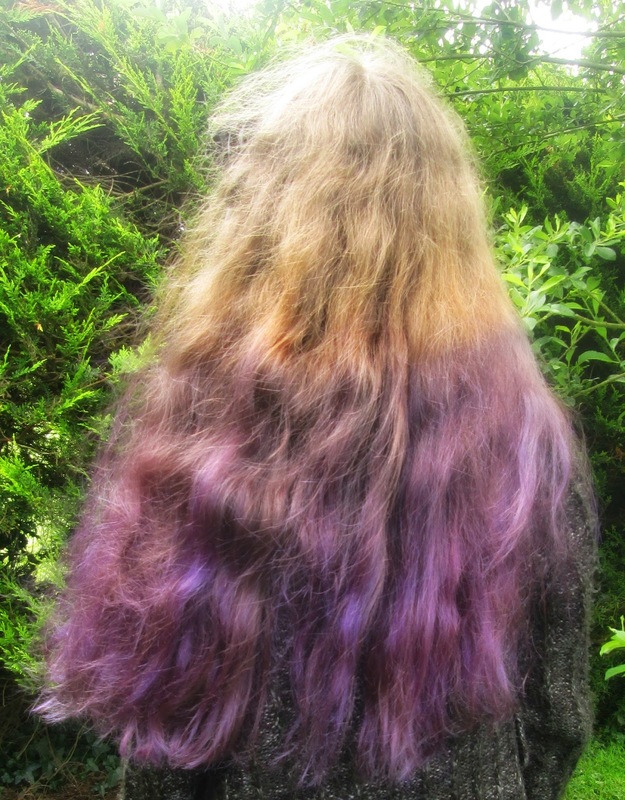 If it doesn't, I'm just going to be like "I TRUSTED YOU PURPLE" but it will probably fade into silver. Oops. In more other news, My room is being painted and my bed and table, etc. are moving to opposite sides of the room so it looks really spacious and I'm just here screaming internally. Above are photos I took of my bedroom during June where everywhere is a mess ! We should probably all place imaginary bets on how long it will take my room to become overcrowded and messy again. One last thing before I finish, If you follow me on Twitter *you should be you should be* you may remember that I brought up the idea of a collaboration blog about two months ago and I'm delighted to tell you that #CollabSunflower began two days and you can visit the blog here. Eleven amazing bloggers and I are running this until the end of August and you can find links to all their blogs over on the collab ! Also, There are only three days left to nominate in the Blog Awards Ireland and I'd love it if Dainty Sprinkles could get into the awards this year ! Last year this blog reached the shortlist *thank you so much* and it would be so amazing it could reach the final in 2014. So click here to nominate Dainty Sprinkles or another Irish blog you love !